Theology is retrieval. You read the Bible, think about God, and apply it to your life. You are retrieving something from the past. It is impossible to think outside of the context of the past, for thinking itself relies on past thoughts. Thinking ex nihilo is, humanly speaking, impossible. Of course, theology is not merely retrieval; it also assumes construction. Nevertheless, this construction inevitably includes the historical dimension. This kind of historical fixation is by no means meant to reduce the importance of present day thinking; much the opposite, historical awareness encourages and stimulates theological discussion—not to mention, humility, discernment, open-mindedness, etc. My only point is this: A theologian (or a scientist, humanist, philosopher, etc.) must be a historical one. Consciously or not, we borrow ideas; we adapt concepts; we use and reuse language; we think as socio-economic creatures; we use that which is familiar to us. Like a person walking, we move forward not by new thinking but by relying on the past. We all have minds of retrieval. Indeed, as they read Scripture, think God, and apply reality, theologians are retrievers par excellence. I am pleased to have read Theology as Retrieval, which argues this point well. You should buy it. W. David Buschart and Kent D. Eilers show that ressourcing is a central mode of theological construction. In order to write theology in the present day, one must retrieve theology from the past. They begin their book by noting that we, the church, necessarily start in the middle of history. We pick up where others left off, and, God willing, will be followed by others in the future. “Like every facet of the church’s life, theology always begins already in the middle. It is caught in the middle of God’s reconciling activity, drawn along by its current, part of its history. In this sense, Christian theology is a normed practice” (11). Therefore, they continue, theology “takes shape in the middle of particular cultures, times and communities,” so that “the truth of the Gospel is timeless, but it is always known and expressed within an actual place, time and people” (11). What do the authors mean by retrieval? They define retrieval as “a mode or style of theological discernment that looks back in order to move forward. It is a particular way of carrying out theological work—what John Webster calls ‘an attitude of mind’—in which resources from the past are found distinctly advantageous for the present situation” (12). 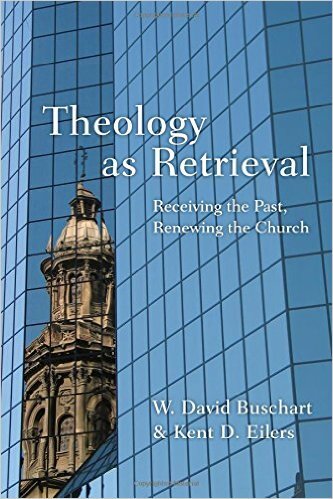 Echoing the authors, I would say that retrieval is simply reclaiming, refurbishing, and refashioning the theology of the past ages for present purposes in light of Scripture. With this definition of retrieval, the authors then state the purpose of the book: to uncover the “logic of retrieval” in six areas of contemporary theological reflection (Holy Scripture, doctrine, worship, spirituality, mission, and engagement with culture) to cultivate theological discernment (13-14). As the authors variously note, there are several reasons that retrieval is a central concept in theology. I could detect four. First, theological retrieval is an “organic expression” of Christianity’s posture of reception and transmission. Christianity is, of course, founded on Scripture, which is historically and practically located at a certain place and time. Therefore, Christianity requires retrieval (15). Furthermore, Scripture is the “fundamental and archetypal Christian retrieval” (21). As they rightly and helpfully acknowledge, “Reading Scripture is a form of retrieval” (21). The point to be noted here is simply this: the theologies of retrieval we consider can only be undertaken and flourish because of this dynamic of reception and transmission, marked by the inherent tension between stability and development ‘Conservation” is thus part of Christianity’s DNA as it receives the deposit of faith entrusted to the apostles and delivers it to a world that God is “reconciling to himself in Christ” (2 Cor 5:19). (pg. 19). Third, and related, the church of the past and present is one church. The authors use Alister McGrath’s argument that there is “a common factor of central importance to the reappropriation of the past: communal continuity with the past” (The Genesis of Christian Doctrine). As the authors argue, this continuity does not consist in “unthinking reiteration” of theological formulas or attempts simply to reproduce behaviors of the past.” Rather, the church of the past and present are one (32-33). Fourth, theological retrieval opens up contemporary discussions in theology. We often obscure theology as we obscure and forget the past. “Thus the retrievals considered here seek to open contemporary theological reflection to the lines of sight that may have become obscured or clouded by the biases, blinders or prejudices of our own historical and cultural settings” (29). Thereafter, using six chapters, the authors discuss how retrieval relates to issues such as Holy Scripture, doctrine, worship, spirituality, mission, and engagement with culture. I was especially interested in the authors’ discussion of the first two issues, though I will not summarize them here. The book is well-written, easy to follow, and even-handed. It offers clear topic sentences and conclusions. The form of the book is also cogent. The only major downside is that the authors sometimes over-quote sources throughout (for example, see 55-60), making reading slow at times. There are also many tedious descriptions of primary and secondary material (see 84-96). While helpful, the descriptions sometimes take the reader away from the important points and arguments, while bogging down the imagination. I greatly appreciated this book. It is a welcome addition to theological studies. As evangelicals continue to grow in their knowledge of the past and of retrieving it, I believe that this book will be of great use. Its broad contours and specific illustrations reach to the core of the meaning of theological studies. ’’Vincent of Lerins, Communitorium 23.54, in Creeds, Councils and Controversies: Documents Illustrating the History oj the Church, AD 337-461, ed. J. Stevemenson and W. H. C. Frend, revised edition (Grand Rapids: Baker Academic, 2012 ), 373.